Location: Templenoe, County Kerry, Northern Ireland. Ownership / Access: Now owned by an investment company. Notes: Dromore Castle is a house in Templenoe, County Kerry, Ireland, looking out over the Kenmare River. It was built in the 1830s for the Mahony family to a neo-gothic design by Sir Thomas Deane. 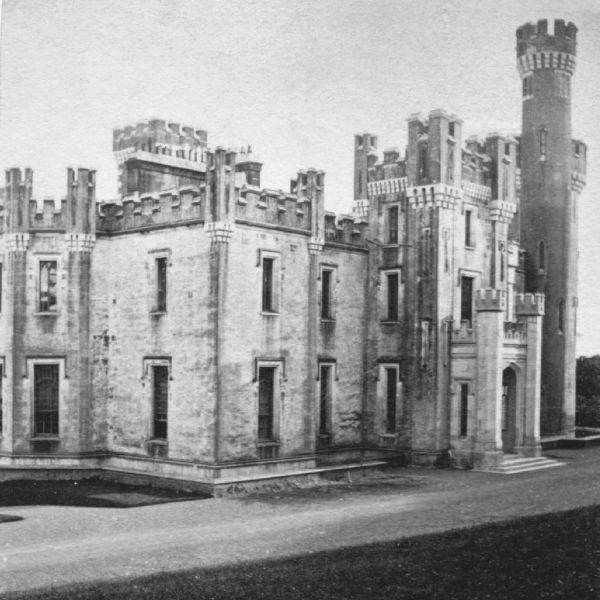 Dromore Castle was designed and built for Denis Mahony by the architect Thomas Deane, probably assisted by his brother Kearns Deane. Work began in 1831, although the account books show that only a negligible amount had been carried out before May 1834. Building work was completed in 1839. The house is in the castellated Gothic Revival style, with an external finish of Roman Cement with limestone dressings. With the notable exception of the grand south facing window with its pointed arch, the windows consist of pointed tracery contained within rectangular frames, a style characteristic of Deane's domestic work. The entrance hall, which is in the form of a long gallery, takes up half of the area of the ground floor. The west wing of the Castle takes the form of a round tower, with a spiral staircase contained within an attached turret. Beyond the Castle's gardens and outbuildings, the majority of the Castle grounds are now owned by Coillte Teoranta, the Irish forestry board. The Kerry Way runs through the grounds, and there are various footpaths leading to the Kenmare River. Entrance to the grounds from the N70 road between Kenmare and Sneem is through a castellated gatehouse, also by Thomas Deane.